So...How Much Debt Have You Paid Off? Well, this post is a little bit…different than what I usually do on the site. But the other day I stumbled across some information that blew my mind a little bit and felt that I really needed to share some things. I've always known that what I wanted to do with M$M was special, and I've definitely talked to enough readers over the past three years to know that I'm at least having a small impact in a few people's lives. One of the weird things about running a website like this one is that it's easy to take numbers for granted. Like…there are a lot of people that come to this site every month, and the annual readership will probably be somewhere north of 2,000,000 in 2018. That's a ton of freaking humans haha. I still have moments where I'm surprised anyone comes to this website at all, but I guess at some point I'll have to get over that. But even though there are a lot of people that come here now, the reality is that only a small fraction actually reach out to me, so it's hard to get an idea of how helpful your stuff really is even if you talk to your readers as much as I do across my social media accounts. I like to think that I'm one of the most active bloggers in the game when it comes to hanging out with my readers, and honestly, it's because the people are what I enjoy the most about this whole thing. Here's a little secret…I'm not that great at blogging. At least, not the way you're “supposed” to do it I guess. Maybe I should care more about all of that because I leave money on the table when I turn down sponsorship opportunities, but it just feels like I've finally found clarity with my business in the past few months. In the beginning of all of this, I thought I needed to be the next someone…but now I just want to be the first me. I want M$M to be a spark that gets people interested in personal finance. Someone did that for me several years ago and it changed my life, so now I want to do it for everyone else that feels stuck like I did. It wasn't that long ago that I had $40k of student loan debt making a teaching salary. I'll never forget how my loans made me feel guilty about holding my marriage back, or how much it sucked to see everyone I knew pass me up in life while I made payments. The anxiety that the loan letters gave me, the feeling of being trapped in my career because of some numbers on a piece of paper, and everything else that comes from the simple name “Sallie Mae” are what drives me to work as hard as I do for this site. People that are going through something like I did with my student loans are the people I enjoy talking to the most; not software engineers or financial analysts retiring in their 30's after making $200k/year in their 20's. That's not to be rude or anything because I see those stories all the time and think that they're incredible. But they just don't really resonate with me as much as someone who makes a realistic wage and is trying to figure out how to make ends meet every month. Those are the people that I want to talk to with this site and hopefully make a difference for. 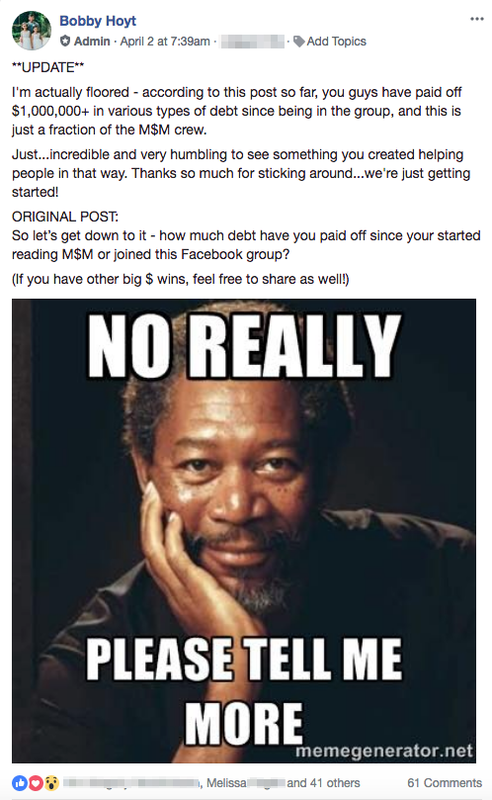 So when I posted something in the M$M Facebook group the other day wondering how much debt everyone had paid off so far, I was genuinely just curious if I was helping. Selling courses and making affiliate sales are cool, but the honest reality is that I'm still a failure if my work isn't actually making anyone's life better or motivating them to get ahead financially. Maybe nobody would answer…maybe a hundred people would answer. I didn't really know. Then I started to get responses that blew me away. It wasn't the most comments I've had on a post or anything like that. It was actually kinda small really. But I started adding up the amounts of debt that people were sharing because some of the totals were pretty amazing. Just like that, it passed $1,000,000. A million freaking dollars. It blew my mind because it was such a small fraction of my audience. I just…that's a lot of paid off debt. I didn't expect it haha. Then I started thinking about how big the site is now, how many people are in my various groups I run and realized that the real student loan payoff number from M$M readers since I started this is probably closer to ten million dollars or more. Now it's it's helping thousands and thousands of people all over the country (and the world really…shout out to international readers). It's just hard to wrap my head around, even though I've worked on it every day of my life the past three years. To be clear, I don't want to take credit for anyone's debt payoff or anything. I didn't make the payments. I didn't make the sacrifices. You're all doing that. I'm just along for the ride. It's so cool, and I'm so happy that you let me be a part of your success. This all might seem like a strange thing to write an entire article about, but I guess that post in the Facebook group was the moment that I realized the scale of what I (and you) have built. The fact that you can start a simple website and after just a few years can have a real impact on people's lives using your words is incredible. We're about to start having local meetups, the M$M community is bumping, and I haven't even mentioned the Facebook Side Hustle students and all of the magic that's going on in that group too. It's all just crazy. It really is. But do you know what's even crazier? We're just getting started. Think about that. If you've been following the site for a while, how much debt have you paid off so far? Feel free to share any other big financial wins below. I think I joined the M$M community back in August 2017, so my debt payoff total since then is $19,915.14. Only $21.5k left until I’m debt free!! I couldn’t agree more with how you feel about most personal finance blogs that speak about retiring early. Now I still read quite a few of those blogs, but I also understand that not everyone is currently making explosive incomes or willing to live ultra frugally to meet those goals. The main things I have taken away from your blog are the steps necessary to *provide value* on an internet-sized scale to *increase income* while simultaneously *staying humble* (no more asterisks). I’ve been a member of the marketing course since its inception and have looked into other venues of providing value myself that your blog has helped identify. I still have plenty of debt to work on but honestly I’ve enjoyed what I’ve created so much from what you and Mike have taught that I’ve reinvested a lot of that to see what can grow from it. Keep up the good work. You’ve been an inspiration (as well as Mike) and one day I’m going to actually meet you fellas. Bet on it. Yeah it’s a weird thing, right? All of those early retirement stories are awesome, but then I see ones that are like “How we save 90% of our income” and they make like $300k/year…I just kinda roll my eyes a little. I make a lot of money now – it’s stupid easy not to spend all of it. Just feels very out of touch with reality, although most of the time it’s reporters/editors coming up with those storylines and not the actual bloggers themselves. Anyways, great people, just not my target audience. I’m so glad that staying humble comes across. That’s maybe the coolest compliment I’ve seen in a while. We have paid off $140,000 (of $215,000 total) of student loans/car since last year. We made the decision to sell our house and move into a one bedroom apartment last February and I stumbled upon your website a few weeks later. It was like the universe knew we needed a community of others who were sick of having debt hang over our heads! We were lucky to make $100,000 off the sale of our home and then paid $40,000 on our own. We are on track to pay off the remaining $75,000 by the end of this year – 18 months ahead of our plan (and 13 years ahead of what Sallie Mae had planned)! Even though we aren’t done, the cloud has already been lifted because we are taking charge and making choices so we can live the lives we want to live. Our health has improved because of the reduced stress, we have lost weight because we are cooking at home, and are content because we are not busy maintaining a 4 bedroom home we didn’t need or wanting things to fill it. I love reading this website and hearing about all the other awesome people out there killing it! I plan to continue to read when we are debt free in 8 months! Wow!!!!! That’s a lot paid off haha. I love seeing stuff like that because I can only imagine what kind of burden that lifts for you. I think a lot of people discount how much the loans can mess with you from a mental standpoint. Yes, please stick around when they are gone!!!!! It really is pretty awesome though. I had toyed with the idea of making a debt tracker for the M$M FB group – and got a ton of supportive feedback – but ultimately decided to not pursue it right now. It is definitely nuts though how motivated everyone in the group is to pay off debt! Hey man if you want to make a debt tracker, I’m all over it. I have been thinking of something for people to add their numbers to so we can see how the whole M$M crew is doing…it would probably be pretty insane. We just recently crashed below the 10K mark for our debt! Should have it paid off by the end of the year so we can start saving for a down payment on a house! Woot!!! That’s incredible!!!!!! So freaking cool. That’s an incredible amount of debt paid off! For us, we had a combined $40K in student loans + a $15K car loan. As of last month, our student loans are fully paid off, and we only have $4K left on the car loan. Soooo close to debt freedom!! Wow that’s great; had no idea you were that close! This is awesome! So cool to know what a huge role you’ve played in someone’s life through your site. I found M$M shortly after my husband and I started our debt-free journey in January of 2017. We became credit card debt-free in December 2017, paying off a little over $25,000! The only thing left is our auto loan, which we plan to get back to paying off aggressively once our baby is born at the end of this month (currently stashing away all extra funds in savings to prepare for anything unexpected with pregnancy or delivery). Can’t wait to be completely DEBT-FREEEEE! It is really cool and very humbling that the site helps people that much. I would have never thought that it would get here so quickly! Congrats in advance on the baby!!!!!!! So excited for you! In the past 8 months I’ve paid off about $15,000 in student loan debt on less than $30,000 / year salary. Dude hell yeah. That’s awesome. My oldest son bought a new vehicle in January 2017 and his loan started off around 36k. As of March 2018 his remaining balance is approximately 16k. He finally graduated in December and is able to work more hours to achieve his goal of paying his vehicle off in 2 years. He does live at home but also has real bills that he is responsible for. Very proud of his hard work and determination to not be in debt! That’s great!!!! Hope the family is doing well! To be honest, I’m not sure how long I’ve followed your site – probably two or three years . I’ve paid off over $96,000 in student loan debt from law school and am now student loan debt FREE! (and debt free except my mortgage). Best feeling in the world! It took me just about 5 years to pay them off once I got serious about it. I could have done it sooner, but switched jobs in the middle, had a baby, bought a new house, and became a landlord. I made my final student loan payment in December 2017 – feels so good to have that monkey off of my shoulder! And now its time to start saving for my son’s education so he never has to go through the student loan disaster and can start out life after school debt free! Can’t even imagine what that would be like and I’m so happy I know I’ll be able to give that to him! I remember that last payment feeling. Definitely one of the best things in the world, and very hard to describe to people that haven’t had student loans before. We have paid off $120,000 in student loans in 2 years, and became debt free this month! It’s an amazing feeling! So glad to see others succeeding in paying off debt! Holy crap. Haha. I will shoot you an email – I’d love to hear more about your story! I’ve only recently started following your blog with in the last couple of months, but have been inspired by the FIRE movement for the past couple of years. I commend you on sharing your thoughts regarding your blog and mission, and the authenticity around getting excited for regular income folks (like me and my husband). Since I caught on to the FIRE movement 2ish years ago, I have paid off $35,000 in debt. It is really what has propelled and motivated me to knock it all out. As always thank you for sharing. Looking forward to your future posts. Well don’t sell yourself short – you and your husband aren’t normal! The fact that you’re interested in this stuff at all makes you awesome. 🙂 Congrats on paying off the $35k! Wow!!!!!!!!!! This is incredible. So glad you love the site! In the last 5 months I’ve paid off $18,760 in debt! That includes a bit in student loans and paying off a vehicle! Monthly payments on those debts went from $863 to $344! 23k since October! Love your blog and FB site, and thank you for doing such a community service! Keep up the good work! I’ve been reading your blog periodically in spurts since August of last year. I would find an article, read several. Find an article, read several. Since August I’ve paid off approximately $65,000 in mortgage and $1,600 in car loan. Geez $65,000+???? That is amazing. I found Millennial Money Man shortly after we moved to Houston in May 2016. I scoured the internet for good financial advice (besides the same don’t buy Starbucks everyday crap). At the time, we were probably at a net work of negative 120k. Most of that debt came from my husband and I making sacrifices so that we could both start our careers, so I don’t consider us to be financially irresponsible. When you have two kids, there is only so much sacrifice and side hustling you can do. This year after our tax refund came in, our net worth is up to negative 70k. That is an improvement of 50k in less than two years. Yay us! I don’t consider debt payoff alone in calculating our success, because we also started saving for retirement since starting our careers. I hope to continue to grow our net worth by starting my side hustle (FB ads ;). My personal goal is to pay off credit cards (30k ouch) in the next two years and work on buying a house soonafter. Mmm I like Starbucks haha. Are you going to come to the Houston M$M meetup? I’m so glad you’re in the FB Side Hustle course! Congrats on the $50k swing in net worth – you’re totally right. Sometimes you can only sacrifice and side hustle so much, but I think the FBSH will be a good fit for you. Ben’s training in the private group on client acquisition is going to be the bomb tonight – definitely make sure you check that out! I have been trying to keep an eye out for information regarding the Houston M$M meetup. I would definitely want to attend. I am hopeful/fearful that my investment in the FB Side Hustle course will payoff very soon! I really enjoyed Ben’s training in the private group. It gave me great insight in what I could do next…. I am thinking maybe once I have two steady clients. I started out with 151k of student loans in April 2015, and I will be at 58k on Friday! I have two years left until no more loans! I paid off almost $6,000 last year which considering the year before was a measly $600 really got me pumped. I paid off my car this year which was awesome but did take out a small loan to buy and fix a camper to move into. It was a difficult decison to make but once I am living in the camper it will pay itself off quickly! I totally understand what you’re saying regarding people being relateable. I love Dave Ramsey’s Baby Steps his show sometimes drives me crazy! The stories about 2 income household making $400,000 a year and blasting through $250,000 of debt. That’s awesome, but not relatable for someone who is single, makes $40,000 a year on two jobs. There is no one around to do dishes and laundry when I am working and can’t do them. No one to pick up the slack and make extra income when I am sick, burnt out, or traveling for work. In that way I find your site much more relateable and realistic for my life style. My fiance had $144,000 in student loan debt after she got graduated from college with a nursing degree in 2015. I graduated in 2016 with a marketing degree with $33,000 in student loans. We also had $17,000 combined for our car loans. My fiance makes about $50K a year while I make $43K. We used to live with my parents for a year until they moved out of state and we were unable to live with her parents because of their small 1-bedroom house so we moved to an apartment for a year. While chipping away at our loans, we were able to save up for our own house (where we live, the mortgage on a starter home is the exact same as our apartment rent, sometimes cheaper!). Out of our combined total of $194,000 in student loans and car loans, we are down to only $66,000. We paid off $128,000 in 3 years! We picked up overtime at our current jobs and I am working on a side hustle gig to do Facebook ads for small businesses (I do Facebook ads at my current job so I’m an ‘expert’ at them already). When we pay off our last $66,000 in student loans, we will put more money into our mortgage ($115,000). It’s a struggle but we keep working at it. We can’t wait to be debt-free to start traveling more and working on our retirement! My wife and I paid off $151,000 in student loans in 23 months. It felt good, but now we’re on to the next goal, saving for the house. With a plan and a little discipline you can achieve any goal! Started reading in July. My wife and I got married on 9/2/18 and a week later we put everything in a sheet and set up our snowball plan. We’ve paid off about $20,000 and have around $95,000 left (credit cards, student loans, car). We’re on track to pay this down in about two years (gonna make it happen faster though). November has been a good month for remember that some months your going to crush it on your debt payment plan and some months your not…and to not guilt myself when other things come up. For example, all my wife wanted for Xmas was to make sure her mom wasn’t alone on Christmas so I decided to buy her a plane ticket across the country instead of extra debt payment. Right decision and I’m happy with it. Thank you for this community! Next focus is contributing to increase income to accelerate the plan! Congrats and you’re very welcome! I think it’s super important to not guilt yourself – in the grand scheme that plane ticket is just a tiny delay in you paying off your debt!